Does the Most Wanted Game of Holiday 2011 Surprise You? 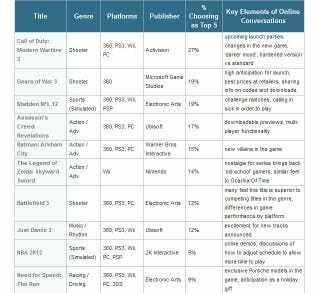 Nielsen, the American market research people, has a list of the top twenty games that are the most anticipated titles of 2011's holiday season. According to this consumer tracking survey, the top twenty games consist of titles going on sale between August and November for the PS3, Xbox 360, and the Wii. Nielsen interviewed 5,000 gamers for its Video Game Tracking via online survey. What's more, 417,433,251 online conversations were monitored. Number one with a bullet is Call of Duty: Modern Warfare 3. Know that "% Choosing as Top 5" refers to the percentage of times that the game made gamers' list of top five games they wanted to buy. Also, the "Key Elements of Online Conversations" shows the buzz around the game. The full list of twenty games is viewable in the link below.